A gourmet place is a living place. At Arnaud Soubeyran, art goes far beyond taste. It is for us a means of expression and exchange, so we welcome throughout the year many cultural events where poetry, music, painting, photography, reading, give festive airs to our workshops. Enjoy Arnaud Soubeyran nougat cooked in a cauldron since 1837. A subtle blend of honey of our regions, Mediterranean almonds and eggs white for a balanced flavour in a creamy texture without being sticky! The famous nougat is a good treat impossible to avoid by the end-of-year festive season and it counts among the 13 Christmas desserts. The toffee, this so simple candy with the taste of childhood! It is however not so easy to find that familiar flavour. The secret of a good toffee is the respect of cooking times! The traditional marshmallow Atelier Des Douceurs is produced without artificial colourings or flavourings which gives this unique taste. Our marshmallow has nothing to do with the common marshmallow! Its soft and creamy texture is not elastic but light and voluptuous thanks to the egg whites beaten stiff. The success of the calisson of Aix helped this confectionery of Provence to become famous. The calisson Arnaud Soubeyran combines this famous recipe, the quality of ingredients and a cooking in a boiling water bath in copper cauldrons. Find the traditional white calisson of Provence and its variations with lemon, tangerine, raspberry, chocolate or pistachio. 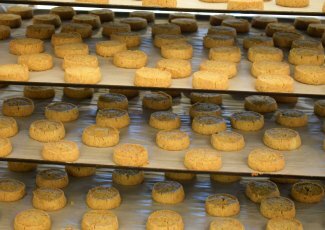 For the manufacturing of the authentic butter cookie Saint Honnoré, we use a flour from Drôme (with Protected Designation of Origin) and selected Mediterranean almonds.The quality of raw materials associated with the traditional know-how can be found in this biscuit with the taste of yesteryear. Find a selection of our famous confectioneries in boxes and gourmet baskets. Nougats, calissons, and coated dried fruits, these original compositions are an ideal gift for lovers of good treats! For nearly 200 years, Arnaud Soubeyran House has maintained an ancestral know-how in the elaboration of traditional confectioneries such as Nougat, Calisson, Toffee, Marshmallow or coated almonds, as many old sweets prepared according to authentic recipes, cooked in copper cauldrons. The Arnaud Soubeyran confectioneries owe much of its delicacy to the choice of the raw materials used. This quality is the result of a good knowledge of the country and a close relationship with the regional producers. The lavender honey is harvested in Provence. 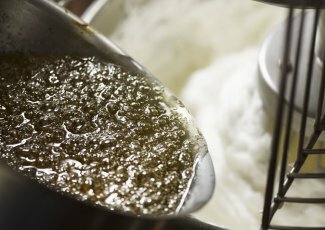 Chosen for its particular fragrance, it is cooked slowly in a boiling water bath to allow the evaporation of the water, still keeping its aromas. The almonds of the Mediterranean basin are crunchy and tasty. They bring to nougat all their brightness. Manufactured with the utmost care, tested and approved by our chefs, here is what you need to make by yourself your own confectioneries! These candies recipes do not require any specific material. Follow the step-by-step instructions and become a master in the art of confectionery. You will be able to reproduce the classics of the Arnaud Soubeyran House with nougat, marshmallow or calisson recipes. We also offer some variations of these products to create pastries or atypical desserts ! for the Arnaud Soubeyran House it started in 1837 by the marriage between Mr. Arnaud, confectioner, and Miss Soubeyran. This audacious couple was one of the first to launch nougat production on a scale exceeding the one of the pastry chef, getting the position of a premium confectionery thanks to the raw materials lovingly selected in the region. Without any direct descendants, Mrs. Soubeyran, who maintained the shop and the manufacturing until 91 years age, left the business to her son-in-law, Jean Abel Pinchard. Following several successions and one takeover, it was thanks to Alfred Cru, nicknamed “the Ace of the master cooks”, that Arnaud Soubeyran came back to the golden age. It must be said that he always saw things on a large scale, evidenced by the Yacht made with 26kg of Nougat that he offered to Grace Kelly in 1956. He made two exclusive recipes, a soft and a hard nougat, with special cooking methods that no one has been able to imitate. In 1977, after several difficult years and an unsuccessful merger attempt, the brand was forced to declare bankruptcy. Three years later, during the auction, Charles Brotte, who was born in Montélimard, bought it… a dream of childhood… He reinstated the famous Mr Cru’s recipes, as well as the cooking methods in copper cauldrons, that are still in use today. Caroline, granddaughter of Charles, and her husband, Didier Honnoré, took over the management of Arnaud Soubeyran House. They founded 5 years later the Nougat museum which now receives more than 60,000 visitors per year. Caroline developed the new extension which includes the shop, the museum and the restaurant / tea room, a lively place that hosts exhibitions throughout the year and brings artists and gourmands together around their passion for good things. Didier was introduced to the art of cooking nougat with Christian Gil, master cooker of the factory since the 80s. They created together the variations of the range “discovery”, unique and exclusive recipes with fig, toffee and more recently with coffee! In 2008, the Arnaud Soubeyran family expanded with the purchase of the Atelier Des Douceurs and its delicious old-fashioned toffees and marshmallows, and in 2014, with the creation of the Saint Honnoré biscuit factory, as a fervent defender of the butter biscuit of yesteryear. Secure payment LCL, with 3D secure technology. Receive your parcel within 5 working days. From 80 € of purchase the shipping costs are offered to you in metropolitan France.